Malt Mark is an adware application developed by SuperWeb LLC. Thus, it belongs to the SuperWeb family of potentially unwanted adware programs that interrupt your web browsing process. We cannot call this application a computer virus because it is just a random application that has been created to boost online marketing profits. Nevertheless, you should remove Malt Mark from your computer because there is no use to keep this program on board. Adware applications might not be evil, but they often end up getting exploited by cyber criminals. On top of that, they are extremely annoying. As mentioned above, Malt Mark comes from the SuperWeb family. We can also see that from its homepage. Maltmark.net is there to make you think that this program is reliable, and it can help you improve your web browsing experience. Nevertheless, the website does not offer a direct download service. Just like Rad Rater, Key Lime Lizard, Boxed Books, and others programs from the same group, Malt Mark clearly gets distributed bundled with freeware. This also means that the application does not enter your system surreptitiously. You install Malt Mark together with some app you have downloaded from a file sharing website. After the installation, Malt Mark adds extension to the Mozilla Firefox and Internet Explorer web browsers. One would expect this app to be compatible with Google Chrome as well, but it seems that the newest versions of this browser block Malt Mark citing privacy concerns. The fact that Google Chrome considers Malt Mark a definite security issue should be enough to convince you that there is no need to keep this application on your PC. Malt Mark tracks your web browsing history with tracking cookies. Adware programs collect such information in order to generate customized flow of commercial ads. Malt Mark ads will try to convince you that you have to purchase something at a lower price. The ad content will be related to your most recent searches, but you should NEVER click them. Although Malt Mark may not want to infect you with malware, this application is highly vulnerable to third-party exploitation. You have to realize that adware apps are often misused by malevolent third parties to promote their content. This content is often unreliable. To put it simply, you must uninstall Malt Mark in order to avoid serious computer security issues. It is not hard to remove the application manually. However, after manual removal you should run a full system scan with a licensed antispyware tool. If you have any further questions on how to ensure your system’s security, do not hesitate to leave us a comment in the box below this description. Select Uninstall a program and remove Malt Mark. 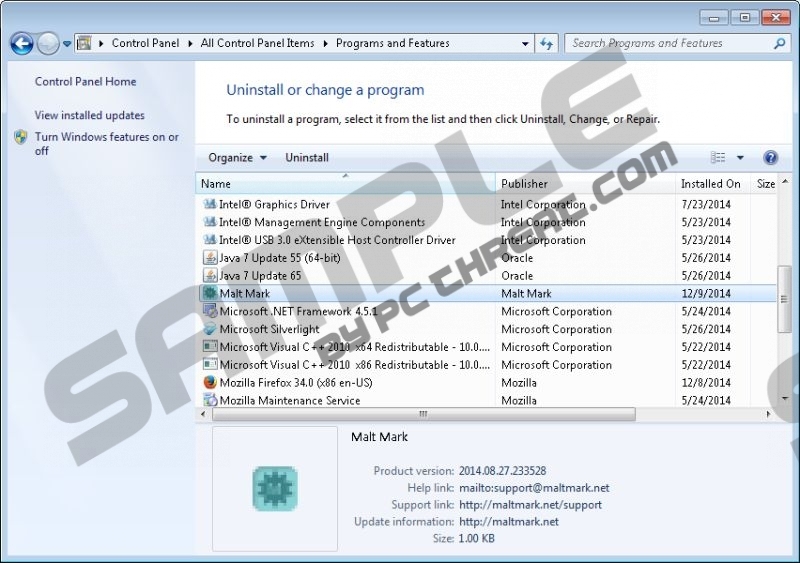 Double-click Add or remove programs and uninstall Malt Mark. Quick & tested solution for Malt Mark removal.